This post is under “James Atkinson, The Book of Revelation.net, The Middle East” and has 13 respond so far. The world media fails time and time again to report this persecution. Let’s keep our persecuted brothers and sisters in our prayers! I would love to know where Israel is on the list James… oh – and the U.S. There is no place in this world that Christians escape persecution. However, it’s good for our understanding of the signs of times where most of this persecution is occuring and at what level. It’s wise to understand where the stage is being set for the future. 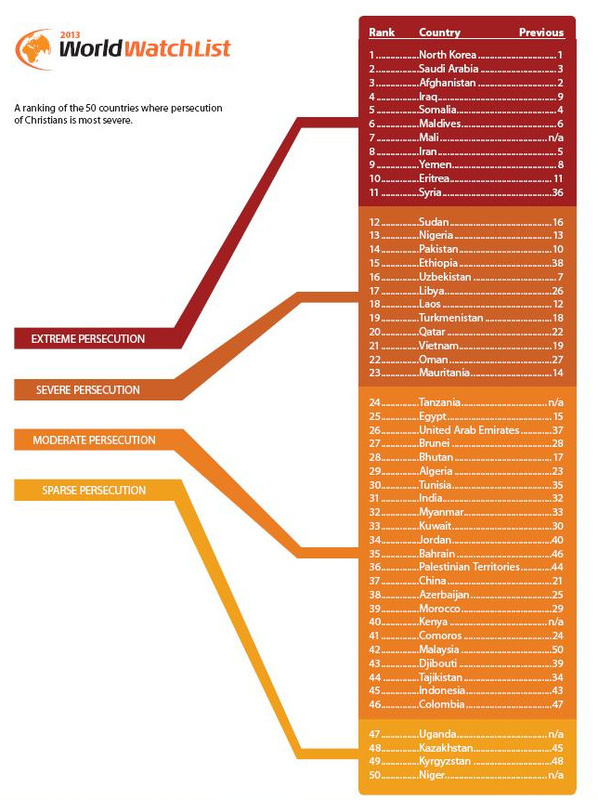 For me, I think the main purpose of the table is not a competiton to wage against any country or people we may dislike but simply to show where the highest concentrations of persecution are occurring. The trend is clear to see which is the main point of the table. However, actively persecuting Christians with imprisonment, death and forbidding to speak the Word of God brings a country dangerously close to the wrath of God. I am aware that many of the countries on the list are also mentioned in the Old Testament as coming under the judgment of God and will be utterly destroyed by the Lord Jesus Christ himself when he returns. Woe. I know this is a bit off topic but i would just like to share something that came to mind earlier today. I saw a video on youtube about how to be rich. It had over 14 million views and in the video the speaker quotes “if you want to be successful as much as you want to breathe, you’ll be successful”, and it came to me that if we want to be humble and grow into God’s Word as much as we want other things in life, the result will be far greater than just being able to afford expensive things, we will be uplifted by His love and spend our lives growing into the image of His Word. I just wanted to share this and I hope it has blessed those reading it because it truly blessed me when Father put it in my heart to share. Thank You and God Bless. Aaron, what you are saying (tho’ off topic for this thread) is simply just “right on” and clearly inspired by The Lord. Keep walking …. If God is love then He won’t let us go through this persecution! It’s just teaching fear. Muriel, Don’t fear what is already in the world or what is coming but be full of faith and trust the Lord. The Lord has spoken about the things to come. So many have the same fear as you but you don’t have to carry that fear in your heart my sister. There is a vast amount of instruction in the Word which releases us from fear. We should post some of it here. The early church received the Word of God in much afflictions which set a pattern for things to come. We should follow their example and as Paul said “in nothing terrified by your adversaries” (Philippians 1:28). We should never be terrified but trust in the Lord instead and commit our lives to Him. All the faithful and great men of God in the Word did this. Another pattern is Paul instructing Timothy “but be thou partaker of the afflictions of the gospel” but he didn’t stop there. He said do it “according to the power of God” (2Timothy1:8). Let’s walk in these ways with the same mindset. Let’s not shy away from the prophecies of the afflictions that will come upon the Church but let us learn how to be strong and fearless. Let us put on the whole armour of God so that we may be able to withstand in that day and having done all, to stand in the face of all the evil. We are the overcomers, not those who live in fear. We are the true lions in the kingdom of God and we will overcome that Lucifer, whose roars will one day be reduced to a whimper. Be strong in The Lord. We have already overcome the world and we will overcome him in that day. Firstly, my Father loves you so much and so much that he gave His only son for you (John 3:16). God is Love (1 John 4:16). You say that If God is love then He won’t let us go through this persecution but our Father declares that those who live godly shall suffer persecution (2 Timothy 3:12). In Daniels final seven years this persecution will escalate like never before, even to death for those of us who remain faithful (Revelation 20:4). This does not mean that our Father has stopped loving us. No and one day he shall wipe away every tear from our eyes (Revelation 21:4) and we shall receive the crown of life for being faithful and resisting temptation through this persecution (James 1:12). Remember God loved Jesus Christ so much when he was tortured beyond recognition and then nailed to the cross. He loved Stephen the great evangelist as he was stoned to death and the countless other Christians who fell by way of the Roman persecution in that day. Despite these things, God’s love raised Jesus Christ up and exalted him to on high. One day Stephen, like many others, will also be raised up and rewarded because the Father loves him. Today, our brothers and sisters are being executed in several places in the world for literally being Christian and not denying Christ. I stand in awe of their love and respect towards God and our Lord Jesus Christ – I mourn for them. Our Father never persecutes us but our adversary Satan does. God will one day bring His judgements to this earth but His wrath is not for us (1 Thessalonians 5:9) because of His love toward us. However, He has given man freewill and we shall suffer persecution at the hand of the Antichrist and False Prophet in that day. Indeed, as many Christians and Jews died at the hands of Hitler, who was an antichrist type, many more shall die when the Man of Perdition is raised up in the future. You say it’s just teaching fear. I say we teach the accuracy of God’s Prophetic Word concerning walking in the love of God in the End Times, being spiritually prepared, having the right mind-set, the role of the church in the End Times and so much more. We do this tirelessly with our own financial resources and family commitments because we have a deep burning love towards our brothers and sisters like you. We see our Father’s love and concern for the members of the body of Christ to prepare because time is running out. Woe to anyone who teaches that the body of Christ does not go through the persecution of Daniel’s final seven years. Either they teach out of pure ignorance, because they do not know the accuracy of the Word, or even worse, they contradict what the Word states even after being shown it. I invite any so called teacher or minister to challenge me with the Word I have declared here. We must adhere to our Father’s Word or face the consequences personally. I haven’t read your book yet so I can’t have any answers to what you said above. Hi Muriel, I am James brother of Mark. Mark is the one writing the book ‘Thy Kingdom Come’ which will be published in June. We both teach the Word and run the websites and we both love the Lord. I hope this helps your understanding. It is dangerous to assume that in the day to come, when the Antichrist and False Prophet arises, that Western Governments will seek to protect christians from persecution. A recent report by the UK Government fails to recognise the vast persecution of christians in the world today. Additionally, it is highly evident that Western Governments have increasingly become anti-christian over the last few years. Indeed, their intentional blindness of their eyes, towards the persecution of christians, coupled with their own anti-christian agendas is testament to the spirit of the age we live in. This is only going to increase further as we enter into the final 7 years.